Very often, we have customers who want to know the difference between traditional washing machines and the high-efficiency, “low-water” washers. For those who are trying to go green and reduce their carbon footprint, this is a very important question. Well, here’s the answer: the low-water washing machines on the market today are able to cut your water use by as much 70 percent! That money-saving figure should get your attention, whether you’re particularly environmentally conscious or not! The typical American family does around four hundred loads of laundry annually, using about 40 gallons of water for each load if they use a traditional washing machine. That is 160 gallons of water a year just for washing clothes. Cutting that amount by 70 percent would subtract 112 gallons a year, making the family’s water use for washing clothes just 48 gallons annually. As you can see, this is quite a large difference. Water efficiency is not the only benefit of switching to a low-water washer. These machines also use high-efficiency laundry detergent, of which less is needed for each load. Low-water, high-efficiency washers also have a multitude of choices when it comes to cycles and options. These machines have sensors to adjust the temperature of the water, the water level and the spin to match the size of each load. Washing times are longer with high-efficiency washers, mostly because of the low amount of water they use. It can take 45 to 90 minutes to wash a load on the normal cycle in a low-water washer, whereas it takes only 30 to 45 minutes in a traditional washer. 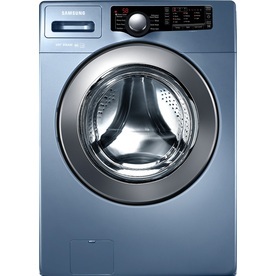 Drying time will be shorter after using one of these low-water washers, though, since their spin cycle is typically much more efficient than that of a traditional washing machine.